It looks a lot like Dark Souls, folks. Only with a new lighting engine that allows dynamic lighting and shadows (welcome to 1997...?). I'm hoping the lack of challenge on display in the gameplay video is due to them doing a walkthrough and having things go a little easier. It was disheartening to see the guy one-shotting enemies, and not being too damaged by attacks. The world design is still fascinating, and that was really the star of the show as far as I'm concerned. Looked amazing, I was having a lot of fears of getting a casual game. It is true it was a bit disheartening to see them slay enemies so easily but as you said Walter it was most likely due to the presentation, hitting an enemy 15 times would not be the best showing. Love that the story will still be hiding a bit in the shadows, making the player seek it out if they want to (if we can trust everything he said in the Q&A). Didn't like the new target indicator, a bit too big and bright, same goes for the souls vfx. Minor complaints though. Overall I cannot wait to play it. Man, that dude doing the interview... Must be a real hit with the ladies. Anyways, game looks great albeit being more of the same. I hope they'll try to push the envelope a bit and won't play it too safe. Definitely happy with what was shown today. Lot of emphasis on the lighting which is interesting. That death montage at the end was really cool. I'm looking forward to the online components. I'd really like some kind of of co-op experience, not necessarly done a la Dark Souls 1. The dynamic events could be really cool. In the E3 CG trailer or even the new footage, the artistic direction, the environments, the color palette seem to me to be more romanticist than before. The gameplay also looks more fluid to me, the way the characters move, strike, etc. And is it me or does Tanimura (the director) have the voice of a badass seiyū? Anyway, I really love the ambiance of the previous games but I got bored pretty quickly (I'm not talking about the conscientiousness needed to manage every challenges) because at some point, I lost curiosity and therefore interest. I felt immersed but not enough to finish the previous games. Great, now I'm in waiting mode again, meaning I can't wait to actually get my hands on this. It seemed like the character was moving a lot faster in combat than out of it, it looked a bit more like Demon's Souls (which is good). I'm not quite sure what to think about the new design of all the HUD elements, they all look a lot more "designed" and use more saturated colors (as does the entire game). I have nothing against color, but they even said that the HUD was not final, so I guess they will tweak it until it feels right. - lack of character customization: A lot of people see that so far, every time the player character is shown he looks pretty much like the one from the first trailer and they conclude that maybe you cannot customize your character anymore like you could in DS1. I don't think this is justified though, this is more likely done to not confuse new players about who they are going to be in the game (anyone remembering the same thing happening with Mass Effect 3? They only used male Sheppard in most of the promotional material for that very reason). Very likely, but even if that's the case, it wasn't the best impression to leave with players, given the scare caused by the Game Informer cover story, which talked about simplifying the game, making it more appealing. Which is why I think they tried to counterbalance the presentation by showing all the ways you can die in the game. That part came across as a little artificial to me. 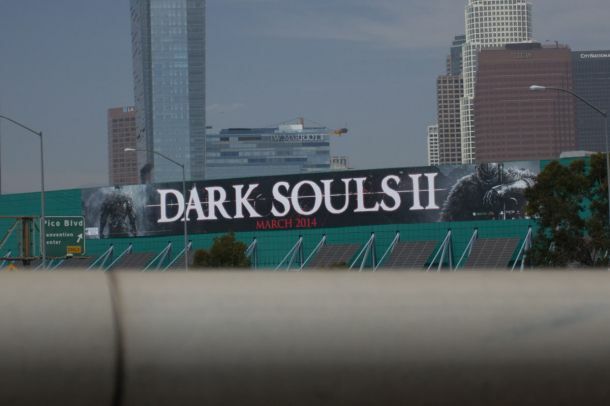 There's also the fact that when they were first showing off Dark Souls, called "Project Dark" at the time, they would demo the game at tradeshows using Solaire as the player character (Im serious), or the generic knight that could be seen on the cover of the original game, and who was ultimately found in the Undead Asylum. This however, again, is a problem of bad messaging and PR on From's behalf, by not being clear and up front that the customization abilities will be retained. There's little doubt in my mind you'll be able to make your own character, but From hasn't been clear on that yet. Try a naked playthrough. Pick "deprived", and don't use any armor at all the entire game. Looks okay. A little boring/minimalist to me. Not giving much away about the game. It also seems premature to be releasing box art when there's not even a release date estimate. Forbes (of all places) also has the box art for all three platforms. I was sort of expecting this to be a next-gen title. That's the older video. Released in December. Huh. Not that big a fan of the music but loving the gameplay. Cant wait. I actually am just about to start the DLC content, finally. Im really looking forward to it. 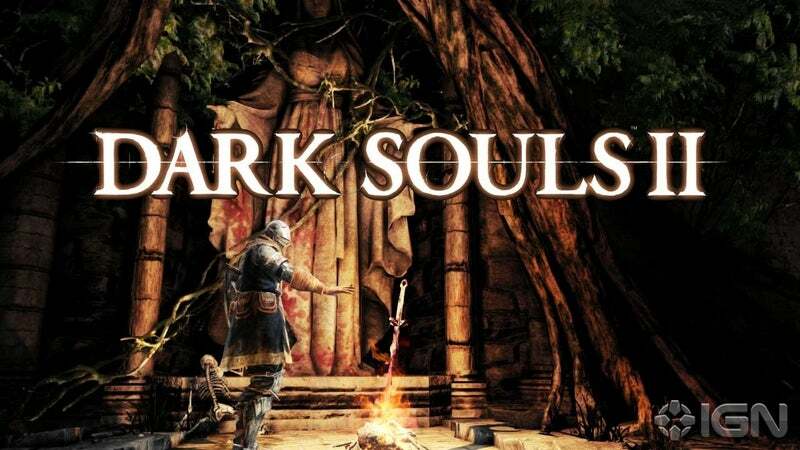 ...the changes to backstabs appear to be a move from the developer to reduce players' reliance on backstabs, which are easy to execute, carry little risk and yield high damage in the first Dark Souls. 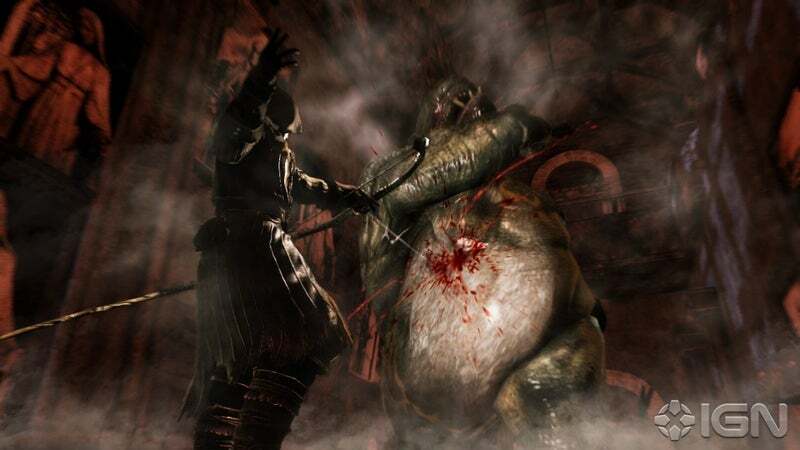 From Software isn't shying away from sending increasing numbers of enemies at players in Dark Souls 2. That sounds like an overstatement. The visual update alone is already a huge difference. Still, the sentiment here is reassuring. All that being said, I'm not one of these guys who's saying "MAKE DARK SOULS BUT WITH NEW AREAS AND WEAPONS." I want From to do what makes sense to them, and I'm sure they are. The Mirror Knight fights in what appears to be a rooftop arena — or at least some environment exposed to the elements, as a dramatic rainstorm soaks the scene. Very excited about the potential for these weather effects. Looked great in the trailer, and I'm glad to know that added atmosphere wasn't just a cheated detail made for the trailer. Neat, thanks. It's nice to see some of their other character classes at work. Something bothers me about the apparent weight of some of those weapons though. The knight sure does handle the greatsword with ease... Hmm. There's still almost a year until release so things will be tweaked of course. I liked that ''He says,he has no intent to make Dark Souls II any easier'' ,I just recently got Dark Souls so I'm noob at it ,but I really enjoy it so far and your Dark Souls thread is really helpful sometimes. ,I just recently got Dark Souls so I'm noob at it ,but I really enjoy it so far and your Dark Souls thread is really helpful sometimes. I'm leaning towards the latter Though a warrior looks like it'd be well-rounded... Who am I kidding, I'll end up a hybrid as always. Dual Swordsman video looks the most fun, though I'm always partial to knights and 2 handed swords myself. I'm sure we'll be able to do both, just depending on how you set your stats. Even if you've been following the news as it trickled out, enjoy this informative video.